The 34-year old American never ceases to astound us and his first round 68 following a 144-day absence from the game must rate as one of the great feats of mental strength in the modern game. Considering the barrage of criticism he has endured since he crashed his SUV outside his home in mysterious circumstances, Woods’ four under par opening effort was arguably far superior to the 66 that 50-year old Fred Couples shot to lead the event or the 67 recorded by 60-year old legend Tom Watson. Rapped over the knuckles by Augusta National chairman Billy Payne on Wednesday, he appears to have accepted his lumps with good grace and moved on. 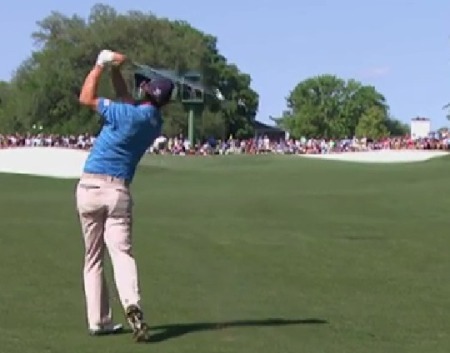 Payne made is feelings clear to Woods in person and the world number one had no complaints. “I was disappointed in myself, too,” he said after his best opening round in 16 appearances here. Whether or not Woods can keep it going remains to be seen in the light of his intensive practice sessions over the world’s most famous golf course in recent weeks. That said, you get the impression that he will take some stopping now and if Harrington is hoping he can give Woods a six-stroke start and beat him over the remaining 54 holes, he will have to produce something truly special. His opening 74 (he has broken par just twice in the first round in 11 starts) was lacking in any kind of control. Wildly inaccurate off the tee, it is a testament to his doggedness that he was just one over for the day playing the last. But he hit the worst drive seen on the 18th all day - a vicious, snap hook that clattered into the trees just 50 yards from the tee. His bogey five, which he made after a punched recovery to the vast green area left of the 18th, was a small miracle. Winning from tied 50th after the first round may well require more divine intervention. It was the cry of a drowning man clutching at straws. But Harrington is right nonetheless. Eight times the Masters champion has shot 74 or worse in the opening round. Craig Stadler shot 75 in 1982 and Woods himself shot 74 in 2005. The other 74 shooters to win the Masters are Mark O’Meara in 1998, Jose Maria Olazabal in 1994, Jack Nicklaus in 1986 and 1963, Sam Snead in 1954 and Horton Smith in 1936. Here’s hoping Harrington can join that illustrious list. Or Rory McIlroy or Graeme McDowell for that matter after rounds of 74 and 75 respectively. It’s possible, but on the evidence of Thurday’s action, it seem highly unlikely. 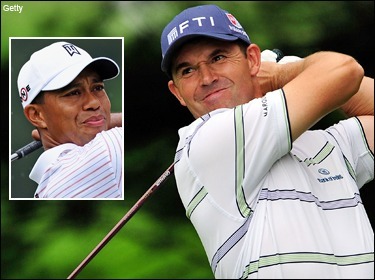 Padraig Harrington and Tiger Woods. Pic: www.golffile.iePadraig Harrington started by looking for a WC before ending his day alongside a disastrous Tiger Woods in facing an MC - missed cut - in the US PGA. As Woods collapsed to a nightmare 77 - his worst ever opening round and his second worst score in a major - Harrington flirted with missing his tee time as he searched frantically for a toilet before the start. In the end he made it with only a couple of minutes to spare but like Tiger he failed to fire and posted a three over 73 that leaves him in danger of missing the cut and failing to qualify for the $10m FedEx Cup play-offs.